Forgive me for refusing to let the matter drop just yet as I am sure most of you really wish never to see Typhoon Glenda again. But seeing as I do every night on the news the damage that the typhoon left behind – even a week after it passed – I just had to know exactly where it passed. This is really amateur investigative work. Procedurally, the investigation went like this. First, the DOST-PAGASA’s Facebook page where I scrolled down-down-down to the early morning of 15 July, when Glenda passed through us. The numbers stand for longitudinal and latitudinal values or positions. N stands for North and E for East. After plotting the typhoon’s movement, it is only now that I fully comprehend why the typhoon was totally terrifying as it passed last Wednesday morning. It passed between Lipa City and the Municipality of Malvar and very, very close to where I myself live on its way to Taal Lake. Remember, the eye of the typhoon itself has no driving winds. Instead, its most powerful winds are just outside the eye. Hence, my own neighbourhood was probably just outside the eye and, therefore, bore the brunt of Glenda’s most powerful winds. 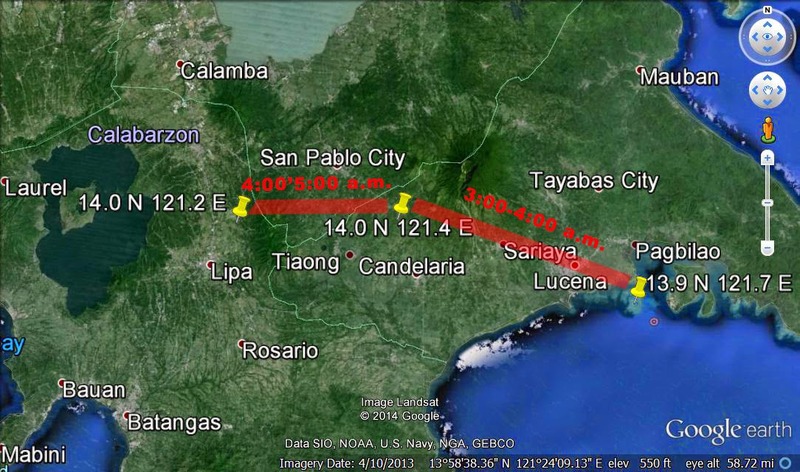 Here is how Glenda cut through Quezon and Batangas. 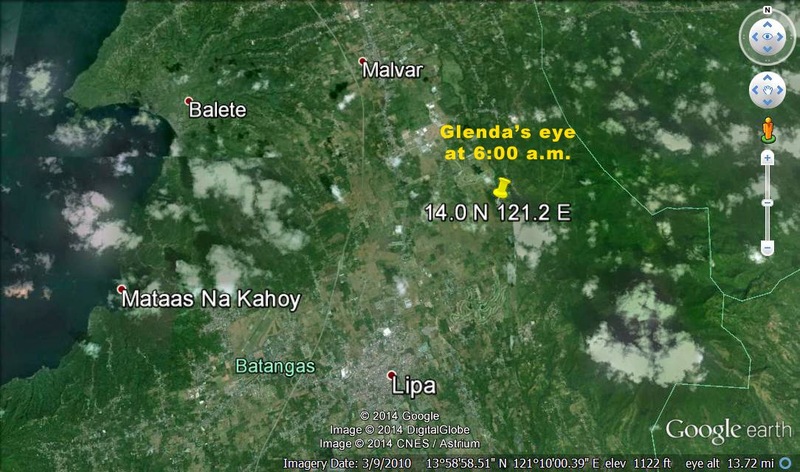 I used Google Earth’s placemarks (they appear as pins on the graphic) to show the exact position of Glenda’s eye. 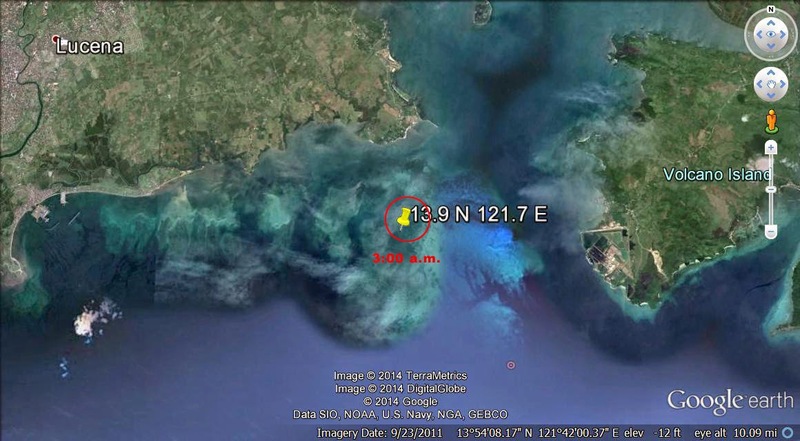 At 3:00 a.m. – the starting point for the plotting – the eye of Glenda was at sea just off Lucena City. 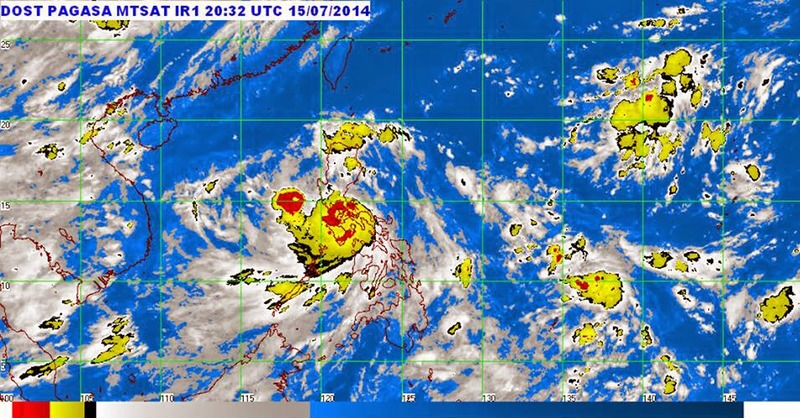 3:00 a.m. Glenda's eye was at sea just off Lucena City in Quezon Province. 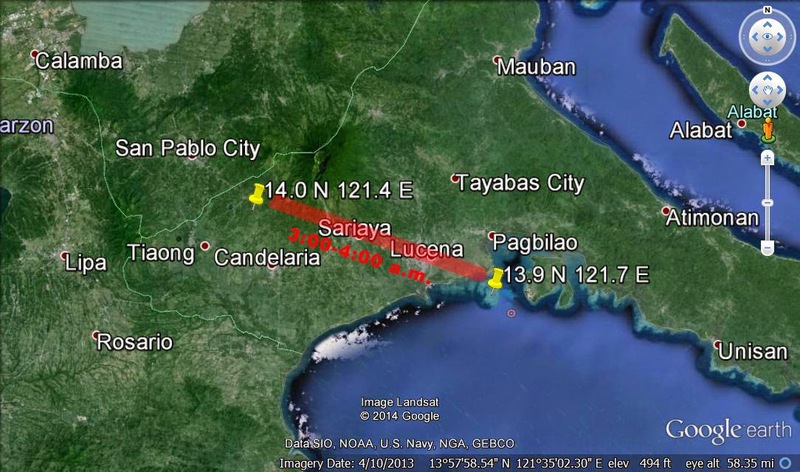 At 4:00, Glenda’s eye had moved between Sariaya in Quezon Province and San Pablo City in Laguna. and San Pablo City in Laguna. Click the image to enlarge. 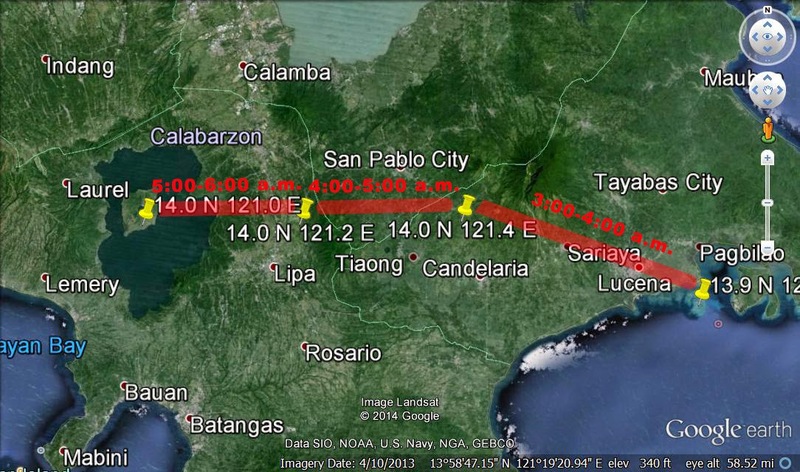 By 5:00 in the morning, the eye was between the Lipa City and the Municipality of Malvar. 5:00 a.m. 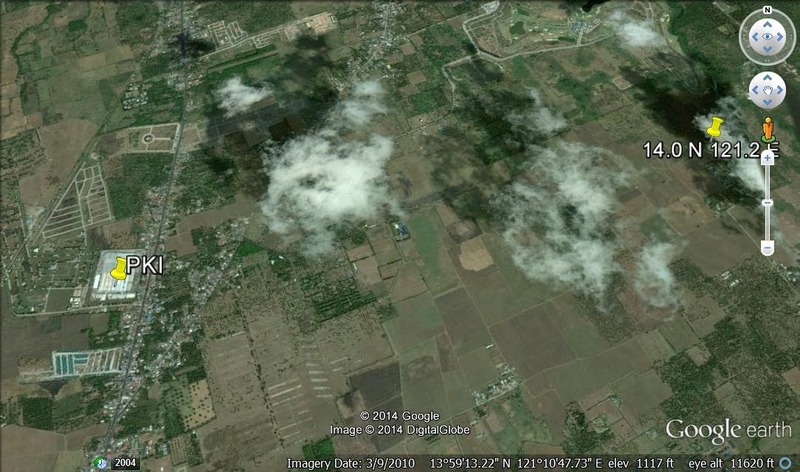 The eye of Glenda was between Malvar and Lipa City. The next graphic is the same location but zoomed in to show the position of the eye relative to the towns of Balete and Mataas-na-Kahoy. to the towns of Balete and Mataas-na-Kahoy. Click the image to enlarge. Zoomed some more, it appears that the eye passed close to the PKI area, although I am not one hundred per cent sure if the building that I have identified as such is indeed the PKI facility along the highway in Inosluban. per cent sure about the placemark named PKI. Click the image to enlarge. Finally, at 6:00 a.m., Glenda’s eye had crossed over to Taal Lake and was, in fact, right over the main Volcano Island. Lake. Click the image to enlarge. 2. All other photos from Google Earth.